Online searches for the word “pollen” have gone through the roof this spring, and if you know anyone with seasonal allergies — and who doesn't? — this isn’t surprising at all: sufferers in many parts of the U.S. have been sniffling, sneezing, coughing and rubbing their eyes like crazy lately. 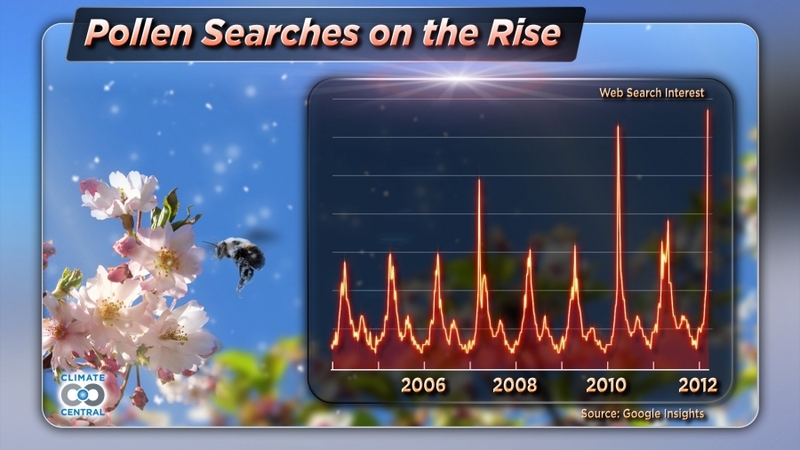 As the graphic above and the interactive graphic below show, it happened in 2010 and 2007 as well, when pollen-triggered spring allergies were particularly bad (the lower spikes represent searches during the fall allergy season, which is generally less intense than the one in spring). The differences between good years and bad reflect different factors — mostly, it’s plain old weather. But there’s evidence for a climate-change connection too. For one thing, the milder winters most areas have had in recent years have been linked to earlier flowering and first leaf for many plants, which means allergy outbreaks are tending to happen earlier in the season. They also may be more intense, on average, and longer lasting. Some studies also show that the extra CO2 that causes global warming also makes some plants grow bigger, enabling them to make more flowers — and thus generate more pollen.